The finest sheets either of us have ever seen we found together in a thrift store in Eugene. Katie was perusing the table linens while across the aisle Mera braved the bedding section. Hiding amidst the polyester nightmares and the 1970s Sesame Street originals, Mera found a queen size set of white sheets with tiny delicate pink polka dots. We stretched them out between us to check for stains, and Katie found the tag: 100% Cotton, Made in Italy. They are perfectly soft and dreamy, but now, after a year of near constant use (and after an initial wash on the sanitize cycle), verging on threadbare. We doubt that either of us will ever find such perfect sheets again, and most certainly not for $3. In the Perfectly Imperfect Home Deborah Needleman advises “buying the best bed linens you can afford” and says about linen sheets in particular that they only improve with age and are durable enough to be “passed down over generations.” We each love the romantically rumpled look of linen bedding, and we’re tempted even though they would definitely tap out the bed linens budget for all time. Here are some images that make us want to drain the coffers. 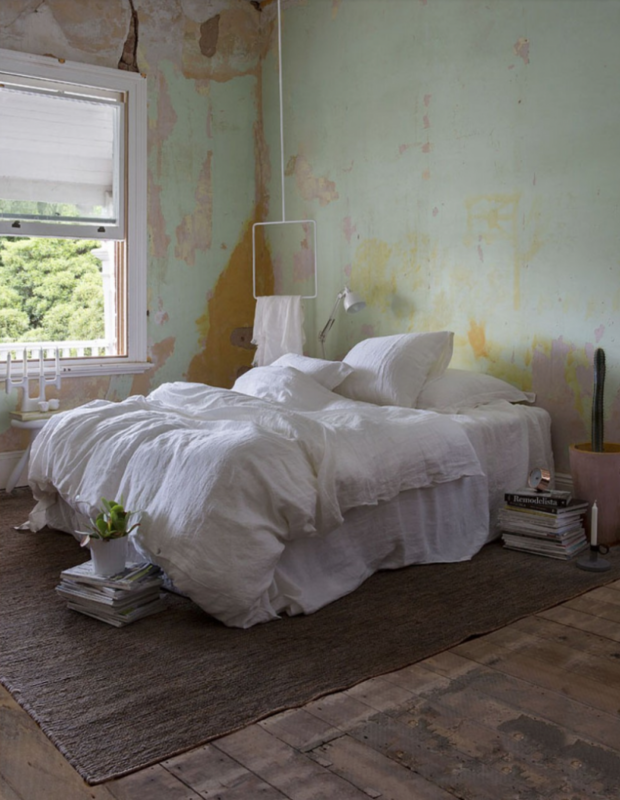 We love this fluffy white cloud of a bed, and could spend ages watching paint peel from this empyreal oasis. Between the parquet floors and the elaborate moldings, this room has a lot going for it. 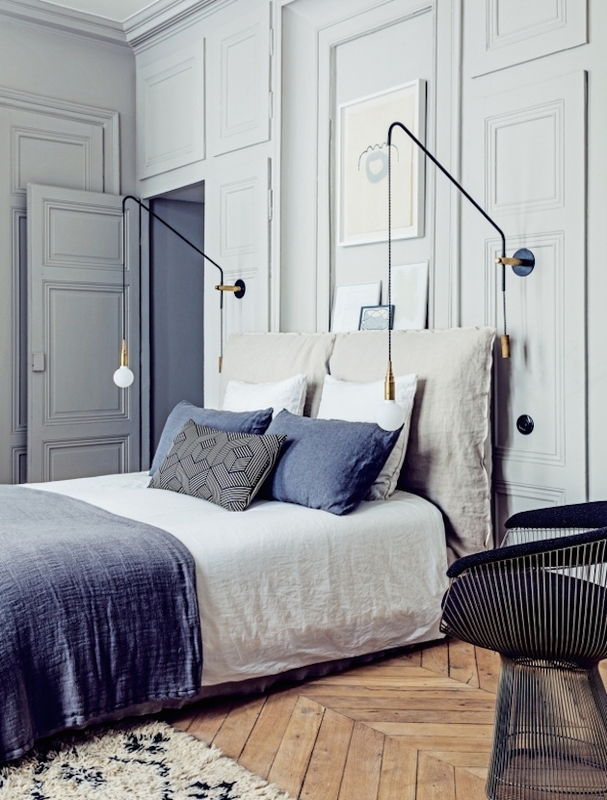 We especially like the way the bed with its layers of linen is a soft and solid counterpoint to the nearby Platnar chair. The slightly ruffled bedskirt in this next bedroom gives the space a more feminine and romantic look, but without getting anywhere near the dreaded shabby chic. Separate duvets on the same bed? Oh heck yeah. Productivity soars and divorce rates plummet. Speaking of successful marriages, pale blush + linen is a trend match made in heaven. What do you think? Do you own linen sheets or have you slept in them somewhere else? Are they all they’re cracked up to be? Have a great week! Iam absolutely a fan. Linen sheets are worth every penny. warm in winter and cool in summer and they get softer but not threadbare with time. They wash like rags and don’t seem to get dingy even when light colours and are better for the environment (cotton takes huge amounts of water). En plus? Ikea has a line that is absolutely affordable, even if expensive by their standard. I was debating linen sheets until I found a white striped D. Porthault set extra discounted. Good luck deciding on a set! Thanks for the reminder about separate duvets. We experienced this in hotels in Norway, and loved it. We intended to bring it home and somehow life went on. Now, thanks to you, it could happen! I have a linen duvet from West Elm that I love. I plan to splurge on a set of sheets someday! I too love the rumpled, relaxed look of linen bedding. I have a friend who bought old linen table cloths and used them for top sheets. They were very nice and also very pretty. I love beds I think. Love all these beds. How have I lived this long without ever having slept in linen sheets! I love the look and feel of linen; spouse does not. The compromise: linen duvet in our room with cotton sheets and full linen bedding in the guestroom, where I occasionally treat myself to a late night of reading and linen-swathed sleep. Heaven. 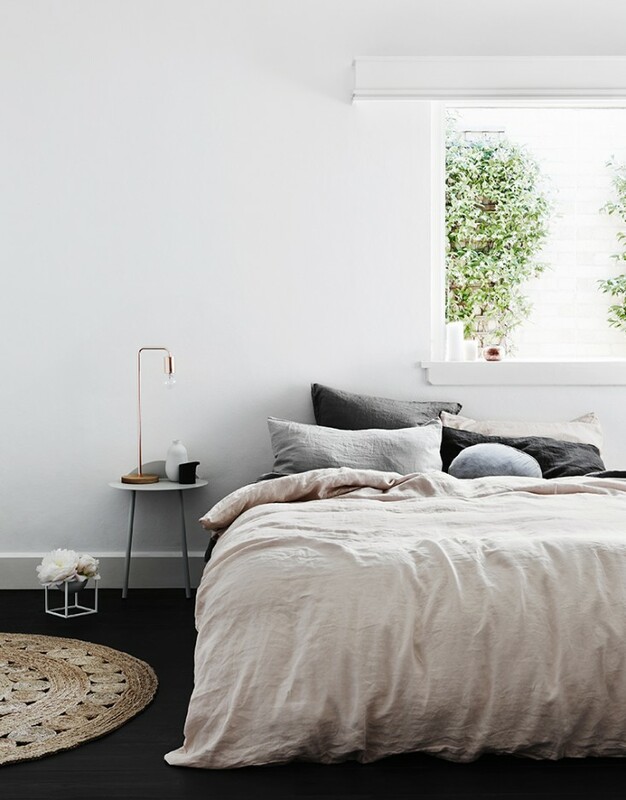 Eileen Fisher has an annual linen bedding sale through Garnet Hill where you can snag great deals on soft washed linen in the current season’s hues. The quality is OK to good. For excellent, I turn to estate sale linen and Tricia Rose, who sources her linen carefully–the website is a delight–and creates exquisitely stitched (and packaged) linen bedding, curtains, table linens, and more. A very good value compared with Restoration Hardware and other linen bedding that, imo, is clearly inferior. 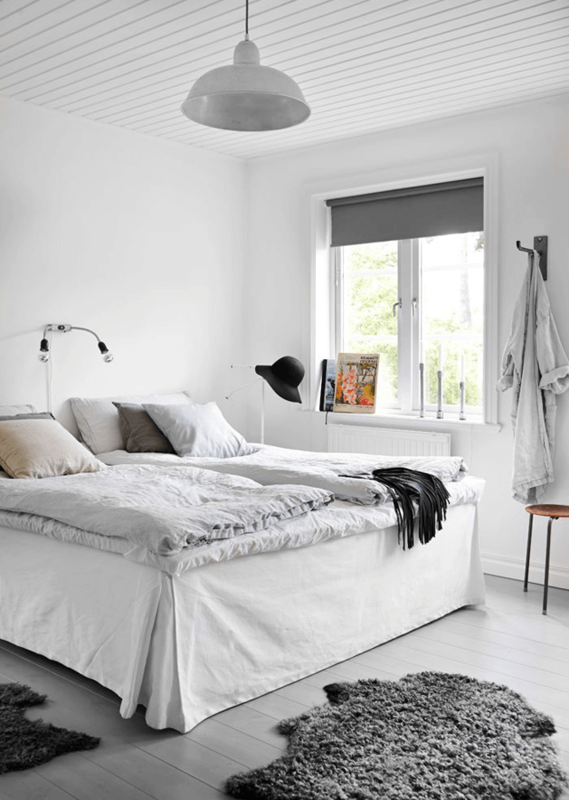 And if my husband shared my deep love of linen sheets, I’d save and make the investment for the Rough Linen bed makeover (natural, white, black, charcoal, and now indigo as well). P.S. Her affordable pinafore is wonderful! I bought a set of linen sheets about 2 years ago from One Kings Lane–made in China. They smelled of a chemical like gasoline when I got them. I washed them a bunch before using, feeling very sorry for the poor folks in China who’d been exposed to whatever that chemical was, and cringing because: California drought + extra washing = guilt! And also worried if the sheets were flammable–they smelled like they would be. Once rid of the chemical smell, I love them. I have to iron the pillow cases because that’s how I roll, but I don’t mind the rumply sheets. We bought our linen duvet & pillow cases at Restoration Hardware outlet when the have the additional 40% off sale price. It is still pricey but so worth it. Even my husband loves them too. It looks and feels nice in winter & cool in summer. I’m in the same boat, but the rave recommendations from everyone here has me thinking it’s a worthy investment. 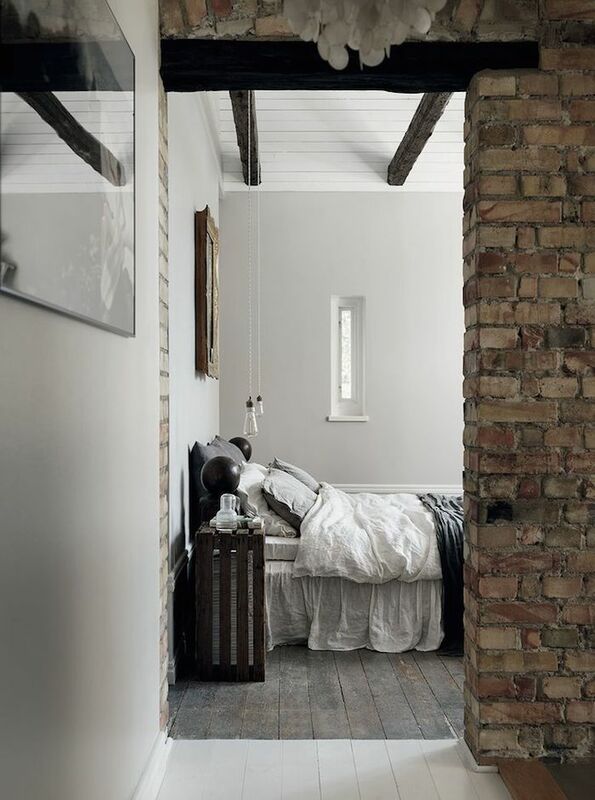 I love linen bedding, my first were a pair of hand woven sheets bought at a yard sale from an older woman from Ireland who told me they’d been her mother’s. They are thick but soft and unfortunately best suited for a single or 3/4 sized bed. I have used them as curtains and have considered making something out of them but appreciate them in their original state too much to cut them! I have a newer pair that are still softening up, and they are wonderful too. They really are a great investment! They really last. I took linen sheets when I went to live in a place without electricity and with only (dirty) well water. They were literally beaten on a rock in a river, as well as rubbed on a hard plastic version of a washing board and bleached with something I couldn’t convince people not to use, and are now softer than they were, but are still white, in one piece, and in the same shape they were when I bought them. No item of clothing, shoe, towel, or similar, lasted beyond the end of that assignment and these are still good enough for guests…good enough for my mother even now I am in a place with amenities. I have bought others since with the same effect – thickness does matter but if real linen it will outlast everything else in the same gauge. Do look at Ikea’s. Twice the price of their regular sheets but still less than I would pay for something cotton from a department store where I live. They are white, so bleached, but nice and thick and seem to be holding up well…I am using them for guests and have so far dealt with colouring pens and a dog.